My coffee is steaming, as is my breath as I exhale in the cold morning air. I’m in Alaska. My home state. I’m back, for the first time in three years, and it’s May. There’s still a bite of winter in the air. I’m standing aboard the bow of the Safari Endeavour, a ship operated by Seattle-based UnCruise Adventures. When most people think “Alaska Cruise” they don’t think of UnCruise ships. They think of gargantuan white-hulled ghosts that power churn through the waterways of Southeast Alaska in search of whales, wildlife, and wilderness – but often see very little of any because of their heavy ecological footprint. UnCruise, as their name suggests, approaches cruising differently, seeking to take visitors deeper into a destination than other cruise companies do (or can). As part of their new campaign to promote shoulder season travel in Alaska (May and late August/September), I was invited to board the Safari Endeavour in May, when the snow has stopped – mostly! Many people want to book an Alaska cruise from Seattle. It’s convenient to fly into Seattle, board a ship, and spend a week cutting a path through the wilderness of Southeast Alaska. If you’re craving an Alaska cruise experience, you’re not alone: nearly 1 million travelers took a cruise from Seattle to Alaska in 2016! Three route examples from UnCruise. See more on the UnCruise Adventures website. Regardless of how long your Alaska cruise is (choose from 7 to 14 nights) or where you embark and disembark, UnCruise offers a truly unique cruise opportunity. You will see Alaska as it actually is. Alaska is open and wild and for the most part empty – big ships that cruise through Southeast Alaska can’t reach the coves, bays, and fjords that give you a sense of how huge Alaska is (and how small you are in it). An average day on UnCruise starts with yoga on the aft deck in the chilly morning air. There’s nothing quite like waking up – and warming up – through some yoga on an Alaska morning. Afterward, I would enjoy my coffee in the lounge or on the forward deck, followed by breakfast in the dining room. The food aboard the Safari Endeavour is on par with every meal I’ve had on other cruises. After breakfast, you’ll have the opportunity to head out on a morning activity. These activities are announced each evening before by the Expedition Leader for the boat, and you have time to sign up that previous evening. This can be any activity ranging from kayaking to skiff tours to hiking; see the next section of this post for more info about excursions. Lunch is another indulgent affair, followed by more activities off the ship. One of my favorite parts of UnCruise was how each day our goal was to get off the ship. Bigger cruise companies want you to stay on the ship where you spend more money; UnCruise wants you to experience the destination, and all activities are in service of this goal. Most people would spend the late afternoon relaxing in their cabin, the open air hot tubs, or the lounge. At 5 pm, Happy Hour would begin as Jimmy, our bartender, unveiled the day’s specialty cocktail. Dinner was around 6 pm, followed by an evening talk in the lounge on subjects ranging from glaciers to grizzly bears. Then, most people would wander off to bed or stay in the lounge for an additional glass of wine or whiskey. The rhythm of life on the ship was immediately predictable and reassuring, without ever feeling dull. After a few days, I looked forward to each new phase of the day, and by the end of the 7-night cruise, I was reticent to give up my new lifestyle of delicious meals, adventurous activities, and a lot of lounging around. Read on to dive into the exact activities and experiences I had on my UnCruise trip in May 2017. Here’s the 7-night Inner Reaches Eastern Coves itinerary I sailed aboard the Safari Endeavour. My friend Marissa from Postcards to Seattle joined me on this trip, so you may see her in some photos! After flying from Seattle to Ketchikan in the morning, Marissa and I explored the small town while waiting to go board our ship. We wandered past the huge cruise terminal, tiny local souvenir shops, and ate at a local bar. We woke up our first morning as we pulled into Misty Fjords National Monument. With fjords that rival any you’ll see in Norway, mirror-smooth glass, and my favorite type of clouds in the trees, it was the perfect spot for our first off-ship excursion (kayaking!). Misty Fjords is one of the most stunning spots I’ve seen in Alaska – it’s also a place you’ll never see if you take a big ship cruise! Another day in the Alaskan wilderness, we spent the day doing skiff tours and hiking. This is where we learned the expression “boot sucking mud,” and had our chance to experience it directly. After three days aboard the ship, it was weird to spend most of the day on land in Wrangell, Alaska. Marissa and I spent the morning exploring Petroglyph Beach, where 8,000-year old Tlingit stone carvings were left scattered across the beach. We then learned about more modern Tlingit traditions at Chief Shakes’ House, where local resident Arthur Larsen told us his family history – and heritage. Petroglyph Beach, a one-mile walk from the boat terminal, where 40 stone carvings are revealed at low tide. Mount Dewey and/or Rainbow Falls trails, both short hikes with equally impressive views. After dinner, we also passed through Wrangell Narrows, a 22-mile channel that requires small ships to time their passing by the tides. It’s so narrow and shallow, large cruise ships can’t pass through! Among the several bays and coves we visited on this day, Scenery Cove was most aptly named – it was a picturesque spot to soak in the stunning mountains on all sides. In the afternoon, most people on the boat took a skiff tour to see Baird Glacier. We had to hike across the alluvial plain and various moraines to see the face of the glacier. It was our first glacier encounter (but not our last) and my group was lucky enough to have a glaciologist among us, so we had an extra knowledge boost. Note: What I really liked about the whole UnCruise experience is that it showed that it takes an effort to see the most beautiful sights in Alaska. Yes, there are glaciers you can cruise right up to, but there’s something special about the ones where you have to pick your path across huge smooth boulders and silky silt to get there. If there’s one animal everyone wants to see in Alaska, it’s whales (followed closely by moose and bear). On our day crossing through Frederick Sound, we spent most of the midday dancing with some humpback whales feeding in the area. While we never saw a breach, we saw plenty of breathing and feeding – and even a mother/calf duo! Afterwards, we set out on another set of afternoon activities, and again I opted for kayaking. It was such a peaceful yet active way to see the land up close. On our last full day abroad the Safari Endeavour, we had two treats: a bigger glacier encounter, and activity “free time!” First, we spent the morning in the shadow of Dawes Glacier, a massive tidewater glacier whose icebergs we passed for hours leading up to our arrival. At the glacier, everyone boarded skiffs to navigate the ice-strewn waters to get closer to the face of the glacier. We enjoyed hot chocolate and spotted some harbor seals in the area too. In a week of breathtaking and picturesque moments (yes, two of the most cliched ways to describe it! ), this was a grand finale. Our last afternoon was relatively calm: most people took out kayaks or standup paddleboards at their discretion, took one last dip in the hot tub, or relaxed in the lounge. I opted for the latter. We woke up to disembark in Juneau, the capital of Alaska. It was luckily not a ship day for larger cruise companies, so we had the town to ourselves. Marissa and I met up with Midgi from Juneau Food Tours to explore the blossoming food scene in this tiny town. After a walk through town and delicious brunch, we boarded a bus to the airport and winged back to Seattle… do we have to go home?? For context, most large cruise ships cover up 700 nautical miles in one day. 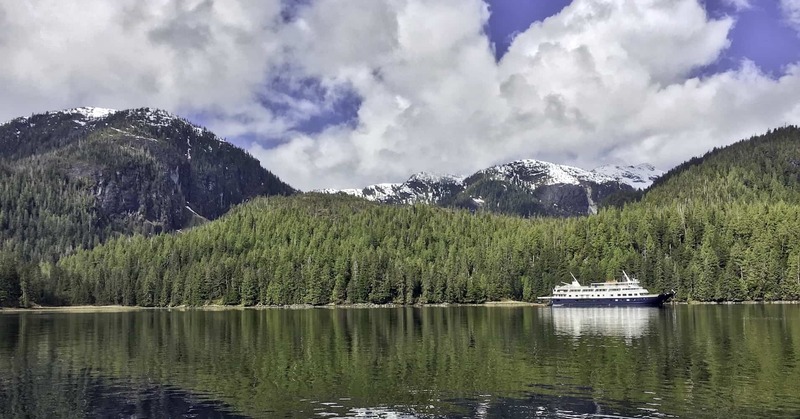 With UnCruise, you spend seven days moving slowly and quietly through the massive waterways of Southeast Alaska, getting a real sense of the beauty of this state. The other important thing to remember is that UnCruise is different for every single route. Even if you take the same Eastern Reaches Inner Coves route I did, your ship will likely dock in different places, offer different activities, and feature a different crew and menu. 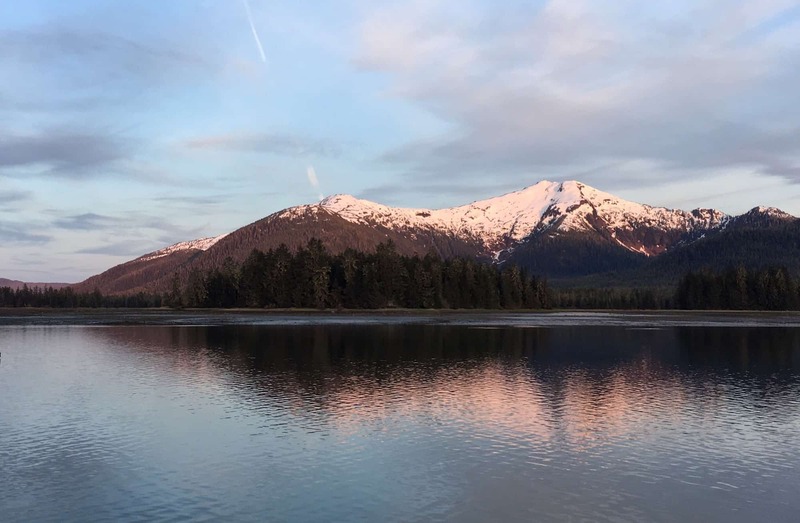 UnCruise adapts to Alaska and all it has to offer: some days you may not go hiking because it’s too muddy, other days you may get a special skiff tour that I never had the chance to do. Aboard the Safari Endeavour, our Expedition Leader Kent would brief us on the options for the next day just before dinner. He would detail the two or three options and then come around to collect our preferences. The Expedition team would then organize tour groups and departure times – all of our gear was provided by UnCruise, so all we did was show up for whatever adventure awaits! These happened intermittently (or every day) throughout the cruise, and added some relaxing aspects to an otherwise active, adventurous cruise. Many people shopping for an Alaska cruise are cost conscious. At first, the price tag for UnCruise made me nervous. After spending a week aboard their ship, I’m confident it’s the best way to see Alaska – and budget friendly. Let’s run some numbers. Note: I chose Royal Caribbean and Norwegian Cruise Line as they are two popular cruise providers for Alaska. I have not used their services, and am basing my comparison on their prices as of August 2017. I am comparing prices currently listed for May 2018 cruises, similar to the one I did. At the end of the day, UnCruise may have more ‘sticker shock,’ because of the high up front cost – but you’ll end up getting an equal (or better) value because so much is included. No need to consider a drink package, whether that massage is worth it, or which excursions you’re willing to miss. On UnCruise, everything is part of the experience, and you get to decide how much you want to do. 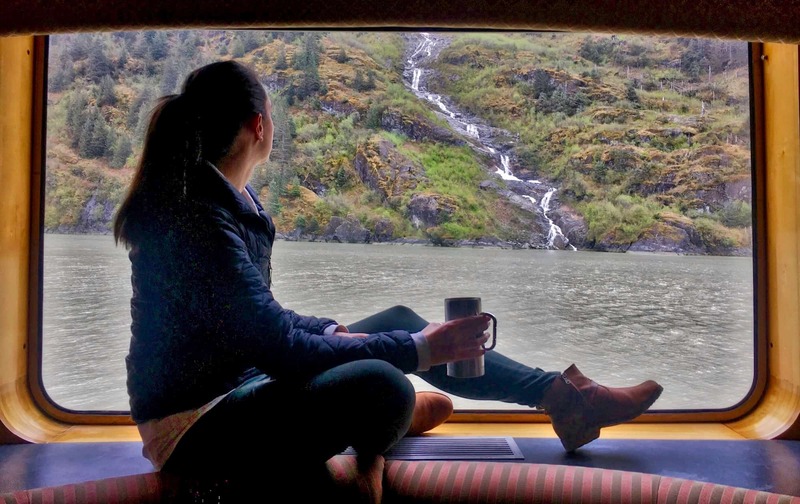 While UnCruise might not be the best fit for family travelers who want more shipboard kid-friendly activities, I would argue it is the best way to see Alaska for any traveler. It’s certainly the only recommendation I can make for cruising in Alaska if you want to actually see Alaska, rather than the inside of a very large ship. If I sound like I’m ‘selling’ UnCruise, it’s because I am! As an Alaskan, I want people to see Alaska the way UnCruise shows it: majestic, vast, and relatively untouched wilderness. As I mentioned in the beginning, I specifically traveled with UnCruise during the shoulder season for Alaska cruises. In May and late August/early September, mornings and evenings are quite cold, and it’s not unreasonable to see frost (or even an early/late season snow!). Here are some tips on why taking a shoulder season cruise to Alaska with UnCruise is a great option. While Alaska is never a balmy destination, it’s only marginally colder in the shoulder season. In addition to the standard extra layers and rain gear I advise all travelers to book, you don’t need much more than a hat, gloves, scarf, and extra wool socks to be set for the spring and autumn in Alaska. Prices are lower across the board. You can beat the summer crowds if you cruise during the shoulder season. There’s never a crowd aboard an UnCruise ship due to their smaller size. But, days in ports like Seward, Ketchikan, and Juneau can be downright unpleasant during the summer. In the shoulder season, there are far fewer ships and fewer crowds to interfere with your experience of Alaska. Do you have questions about UnCruise? I’m happy to answer in the comments! I’ve always wanted to do a cruise through Alaska so I loved seeing your photos. So cool that Uncruise has so many destinations. Thanks for reading! Glad my photos could help, and hopefully you can take an UnCruise some day to one of their cool destinations! I’ve always wanted to go on an Alaska cruise. The scenery is to die for! I love how you included a comparison cost chart! Thanks for reading, Sabrina! Alaska is definitely one of my favorite places to visit, and I’m glad the price comparison helped! Wow! I absolutely loved this. Alaska is on my travel list but I’ve never really entertained the thought of cruising Alaska. Thank you so much for opening my eyes with this well put together piece! Thanks for reading, Brandi! 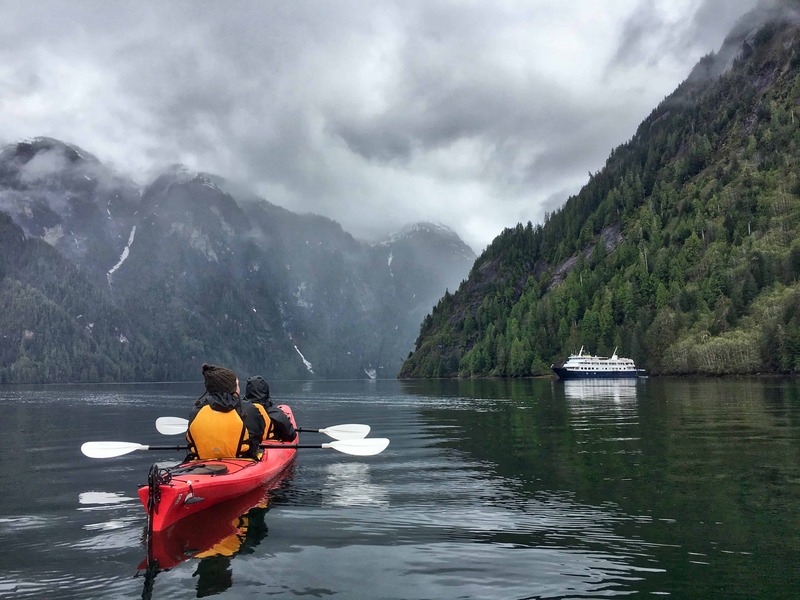 UnCruise is definitely the way to go if you decide to cruise in Alaska! I can imagine – Iceland is beautiful inland, but the coastline isn’t as much, right? Valerie have you had any e perience with the Alaskan Dreams company? Trying to decide between them and UnCruise. There have been some reviews complaining about the maintenance of Uncruise ships. It’s hard to find up to date reviews of either company. Do both have nature experts on board? Is there any history/cultural component regarding the towns along the way? Not interested in shopping stops. Any insights would be welcome.Thank you. Elodia, thanks for your comment! I haven’t cruised with Alaskan Dreams, so I can’t comment on what they can offer. However, I didn’t see any maintenance issues with the Safari Endeavour while I was aboard. I’m actually sailing with UnCruise again next week in Hawaii – so if you want to email me (http://valisemag.com/contact), I can give you an up-to-date review in a few weeks! In Alaska/on the Safari Endeavour, there were definitely experts aboard, and we had some events in the communities that did have specific historic/cultural events (Wrangell in particular). I hope that helps! Hi Valerie & Valise–thank you for sharing this information. We are looking at cruise to Alaska next year and your comments help us to lean toward UnCruise. We’re looking at late May rather than Fall. Do you have any suggestions for this preference? Also, how physical are the hikes? Thank you. Adrianne, thanks so much for reading! As I’ve talked to people comparing UnCruise with other cruises, a lot of people said it really depends on your cruise goals. If you’re traveling with children, for example, UnCruise isn’t a great fit because they don’t have a lot of activities catered to kids like bigger ships. I went in early May, and highly recommend May – the weather was chilly but in a brisk, invigorating way. We didn’t have much rain either, and that only improves through late May and June. As for the hikes, they usually offer two per day when hiking is an option: a “walk” and a “go-getter.” The Go-Getter will be more physically challenging and best for people who have the physical ability and fitness. The walks might offer less vistas, but they’ll still get you on land to explore a bit. This is such a great post, full of valuable information, and stunningly beautiful photos. I’ve never been to Alaska, nor taken a cruise, but it’s definitely on my travel wish list, so I’m saving this post for future reference! What a great article! Very helpful in many ways, thank you! The only question I have for you is …because of the small number of people on the ship, is it a bit “too cozy”? What I mean is, if you are liking the idea of a trip to be alone and romantic with my spouse, is this not the trip? Thanks so much for your reply! Catherine, thanks for your comment! I can’t speak to say, the sound insulation in the walls between cabins ? but I don’t think UnCruise is too cozy. The common area is where a lot of people spend time, but at least on the Safari Endeavour, there were a variety of seating options (couches, chairs, round tables at booths), and you’re never pressured to spend time there unless you want to. There’s also the upper deck, bow, and hot tub on the back deck for some more private areas. Most people seemed really respectful if a couple was in one of those areas. I hope this helps! Thanks for sharing your experience, we hope to book an Alaska trip on UnCruise for next summer. Really appreciate you sharing all your adventures! Glad to help, and thanks for reading, Kathleen! I hope you have an amazing trip!